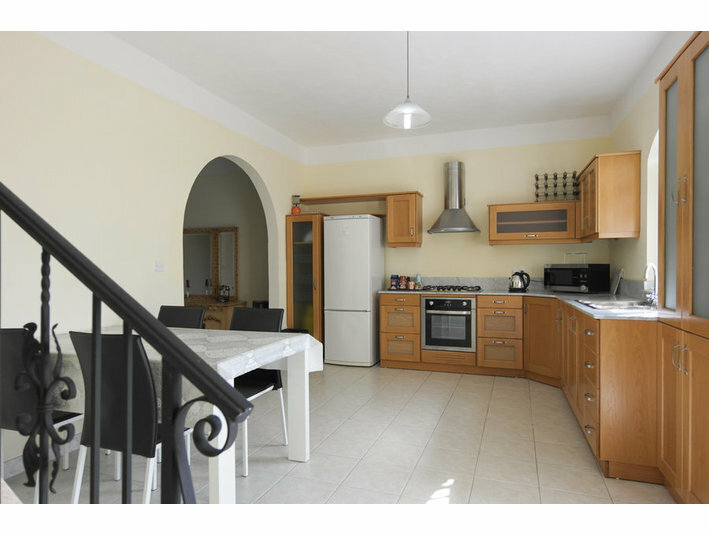 Nestled in the very heart of the highly sought after quaint village of Attard- half way to the silent city of Mdina/Rabat, Catacombs, Verdala/Buskett Gardens and Dingli Cliffs. Close to St. Anton Gardens and to pleasant country walks off the beaten track. Also direct public access to the capital (Valletta) and connecting routes to the rest of the island. You will have access to all amenities without the bustle of a larger town, including our very own reasonably priced local bars, coffee shops, restaurants and confectionery. This ground floor maisonette includes three bedrooms, a brand new modern kitchen with all appliances, living room, bathroom and one spare toilet. Includes most furniture. Also includes one central yard and one back yard with connecting huge three car garage and workshop space (separate price for garage). If you have never lived in a small quaint town now is your chance to savour the experience. For exact location please google: 15, Triq ir-Rand, Attard. You may contact us by replying to this ad at [...] - otherwise you may call: Fixed line Malta: (356) 21412137 or Mobile: (356) 79221055. We may be off the island at (403) 282 3954 or Mobile: (403) 603 8332. Send a message and we will call you back. Thanks.